A woman in her 60s was killed after a tree crushed her car in Ohio Sunday afternoon, while storms damaged homes and took out power lines across the South.The tree fell on top of the woman as she was driving in Bond Hill, in suburban Cincinnati, around 4 p.m. Sunday, according to eyewitnesses. When officials reached the scene they found the woman, the car’s only occupant, dead, according to Cincinnati Police Department Lt. Dennis Swingley. “The tree met her in the road,” said Leonard Washington, of Price Hill, who said he saw the woman driving moments before the tree fell. “It took her front seat and peeled it all the way to the back,” Washington said as he described what he found when he rushed to the crash. Police investigate after a car traveling north on Reading Road in the Bond Hill neighborhood of Cincinnati was crushed by a tree killing the driver on Sunday. 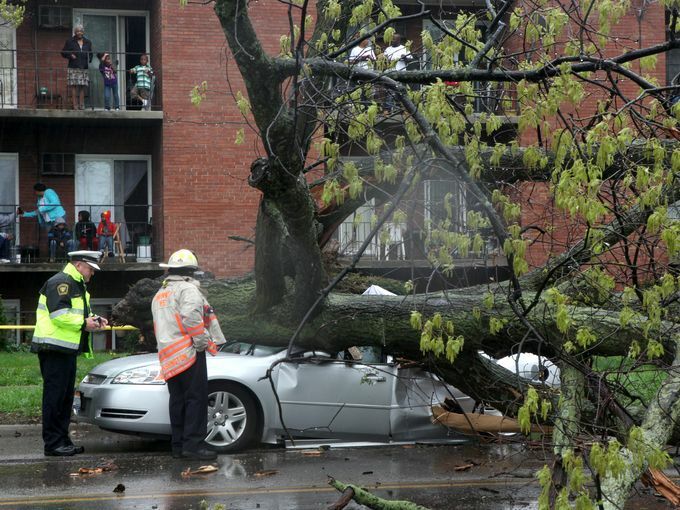 (Photo: The Enquirer/Cameron Knight)Down South, a line of storms caused heavy damage to parts of South Carolina Sunday. In Lexington County, there were numerous reports of damaged homes, downed power lines and uprooted trees. The National Weather Center reported trees down in Orangeburg, Sumter, Calhoun, Aiken, Edgefield and Barnwell counties, while the South Carolina Highway Patrol also reported trees down in Richland County. Several tornado warnings were issued throughout the region, but the National Weather Services has not confirmed if any tornadoes touched down. At 7:30 p.m. on Sunday, SCE&G reported a little over 9,000 power outages across the state.4,000 of the outages were from Aiken County. Reports from the National Weather Service show Aiken County as having received the most damage from the storms. Earlier Sunday, the strong line of storms after several days of heavy rain was too much for some trees in the metro Atlanta area. Downed trees created traffic problems for some drivers and headaches for unlucky homeowners Sunday. Capt. Al Adkins of the Atlanta Fire Department blamed several accidents on the stormy weather and a downed tree. In Grant Park, another homeowner woke up around midnight to find the tree that once stood in his front yard had come down, taking his fence, and the power line with it. The tree also damaged the fence at his business across the street and shattered the front windshield of a car parked nearby. While the storm system had mostly moved on by 3 p.m., homeowners were warned to beware of another line of storms coming through the area Sunday night and early Monday.